The Notman Photo Co., 3 Park Street, Boston. 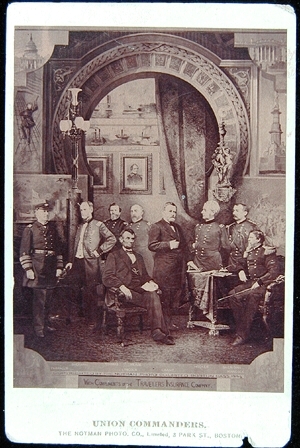 Composite photograph of a group of Civil War Union commanders, used to advertise Travelers Life and Accident Insurance Company of Hartford, Conn. (Company name appears on reverse). For such a scene, individual portraits were made, cut out, and pasted onto a background, then reproduced as a seamless whole. This example was made by Willim Notman, a leading 19th century photographer. Notman opened studios in several northeastern U.S. cities, including Boston, after the 1876 Centennial Exhibition in Philadelphia. The Travelers Life and Accident Insurance Co. is still in business today.